With this healthy & Eggless Banana Bread Recipe, you’re only a few simple ingredients away from the best banana bread ever! It’s made with wheat flour & mashed bananas. 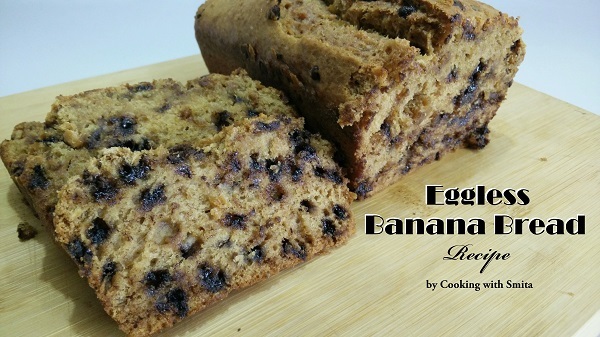 It is Eggless but moist and delicious bread with loads of banana flavour! This is an easy & simple recipe that gives perfect results every time. Cut & mash Bananas in a large bowl. Add Brown Sugar, White Sugar powder and mix well. Add Oil, Curd and Vanilla Essence, again mix well all ingredients. Take another bowl and add dry ingredients – Wheat Flour, Baking Soda, Baking Powder, Salt and mix well. After mixing, add dry mixture to liquid mixture 1 – 2 spoon at a time and mix well to prepare the batter. Add 2 tbsp. water, if required. Pre-heat the microwave to 180-degree celsius. Add chocolate chips into the batter and mix again. Grease baking tin with butter and dust with All Purpose flour before adding the batter. ( I have used 9-inch X 5-inch size Bread tin). Pour the batter into the baking tin, spread evenly. Bake in the microwave for 60 – 70 minutes or till a toothpick inserted in the bread comes out clean. Remove from microwave and let it cool down for 10 minutes. After 10 minutes, remove it from baking tin and place it on a cooling rack, let it cool down to room temperature. You can also serve it warm. After cooling, cut into desired size slices and serve Eggless Banana Bread.